what lock ...? description, picture ...? Hobbs made many locks in a century of business. The safe lock is a 9 Lever Hobbs Patent Protector which from the number 40297 would have been made in 1934. From the twin escutcheons it can be assumed that they were fitted as dual custody locking. I cannot identify the mortice lock although it is just possible that it could have been from a day gate. The 9 Lever lock was used in both safes and strong-room doors in qualities Progress 'D' and above. I attach 1884 brochure copies of that quality. Above that quality much more sophisticated locks were used in addition to the above such as the Anti-Violence and Transmutation Key Locks. However I cannot explain why the stem of the keys should be so long - the duplicate unnecessarily so - when the substance of the doors at the lock is only about 2 inches thick. This photograph illustrates the placement of the locks within the safe door mechanism. 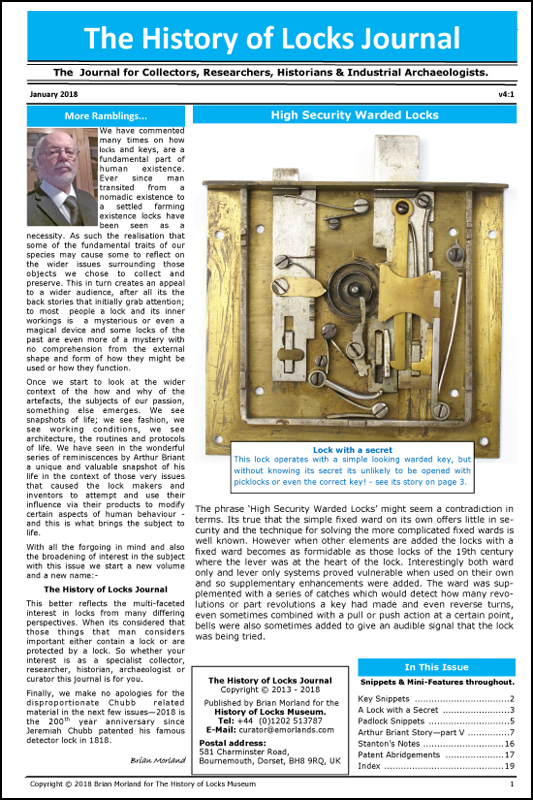 The mortice lock is usually used to secure the back pan or boltwork chamber, and on the ones I have worked on were operated by the main safe lock key.